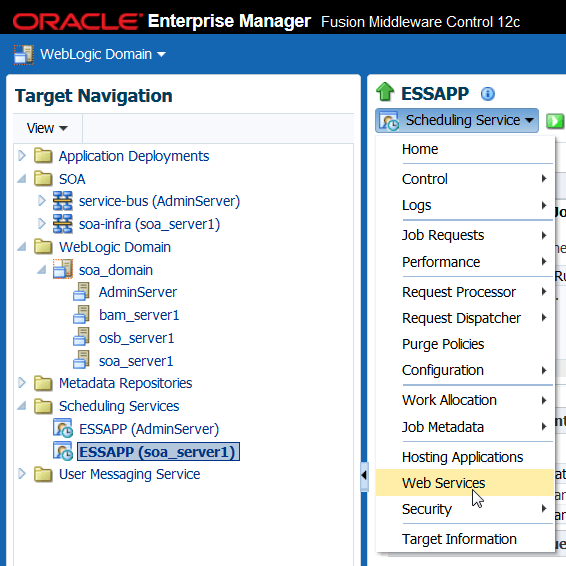 The Fusion Middleware 12.1.3 platform contains the ESS or Enterprise Scheduler Service. 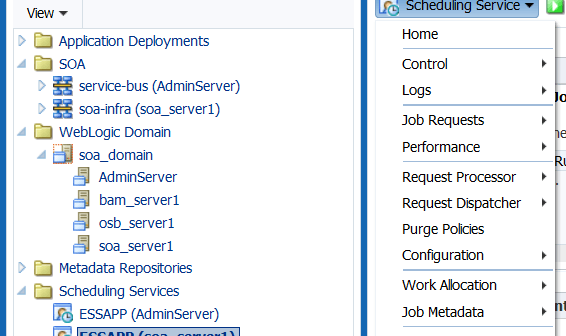 This service can be used as asynchronous, schedule based job orchestrator. It can execute jobs that are Operating System jobs, java calls (local Java or EJB), PL/SQL calls, and Web Service calls (synchronous, asynchronous and one-way) including SOA composite, Service Bus and ADF BC web services. Jobs and schedules can be defined from client applications through a Java API or through the Enterprise Manager FMW Control user interface. 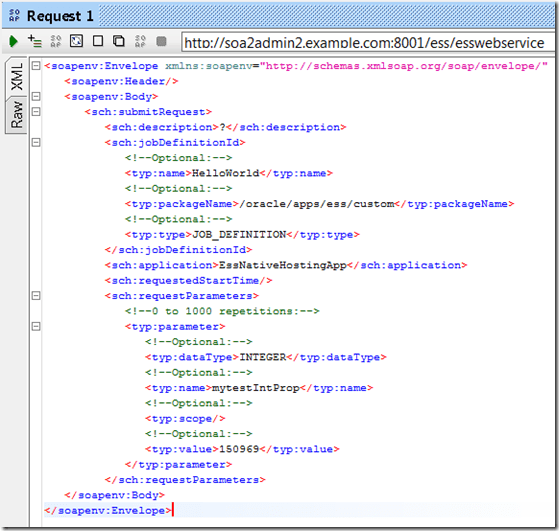 Additionally, ESS exposes a web service through which (pre defined) jobs can be scheduled. 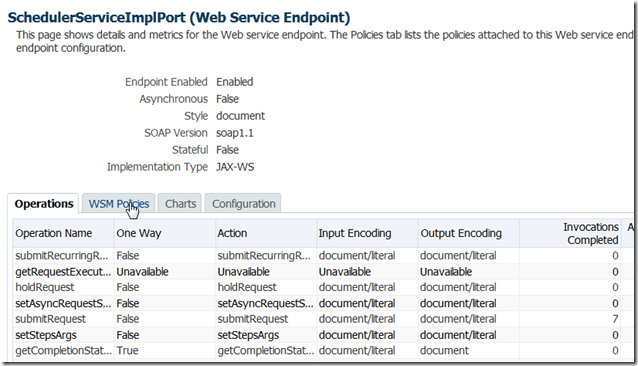 This web service can be invoked from BPEL processes in SOA composites – or from any component that knows how to invoke a SOAP Web Service. 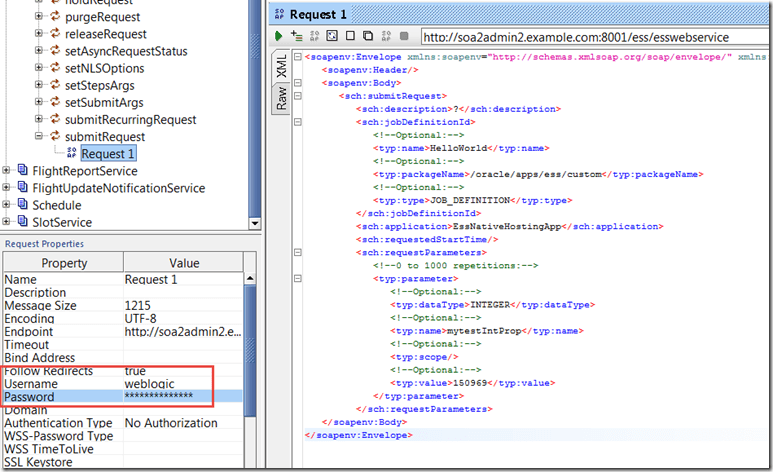 In this article I will briefly demonstrate how to invoke the ESS Web Service from SoapUI. 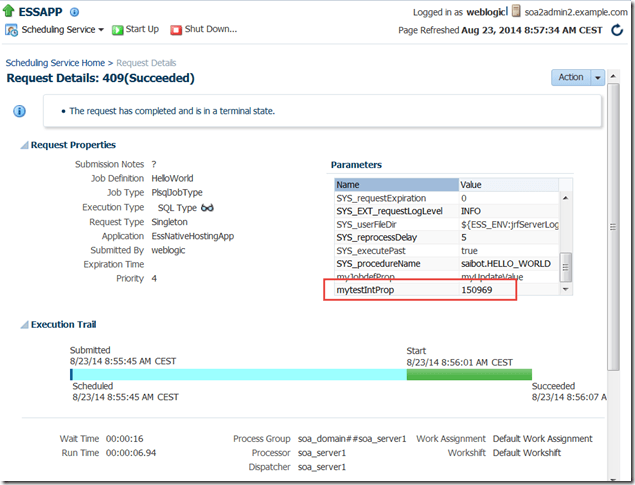 I will not describe how to create the Job Definition – I will assume two pre existing Job Definitions: HelloWorld (of type PL/SQL job) and SendFlightUpdateNotification of type SOA composite based one way Web Service. Both Job Definitions contain application properties – parameters that can be set for every job instance and that are used in the job execution. 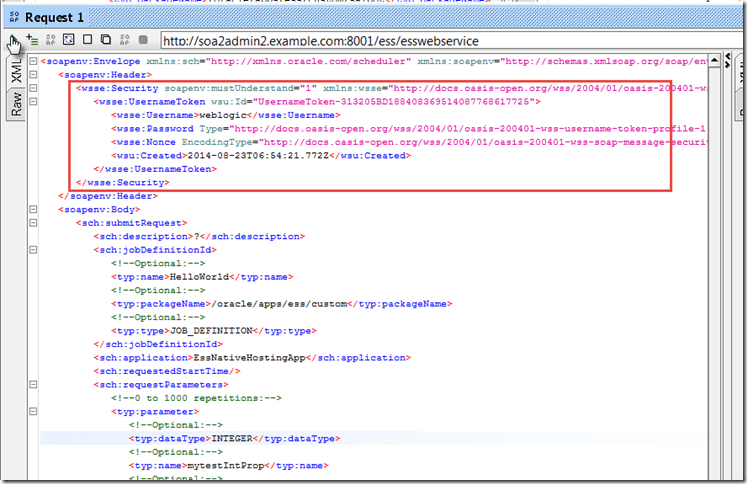 When invoking the ESS Web Service to schedule a job, values for these properties can be passed in. 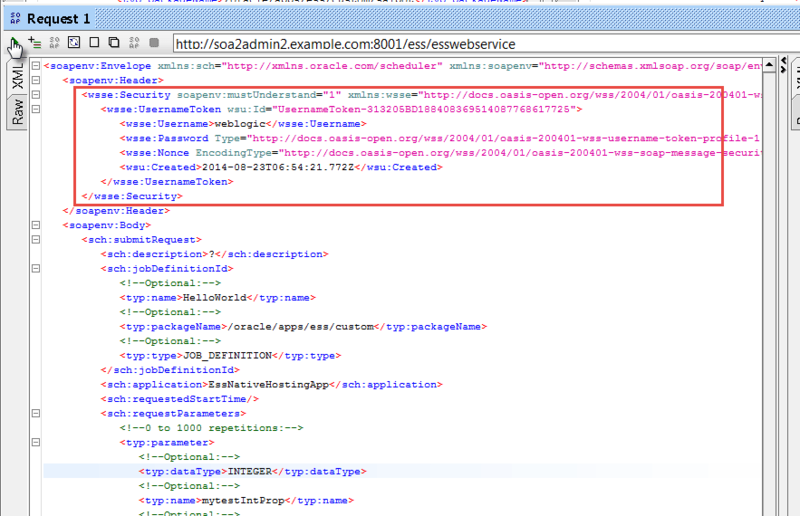 oracle.as.scheduler.RuntimeServiceAccessControlException: ESS-02002 User anonymous does not have sufficient privilege to perform operation submitRequest JobDefinition://oracle/apps/ess/custom/saibot/SendFlightUpdateNotification. 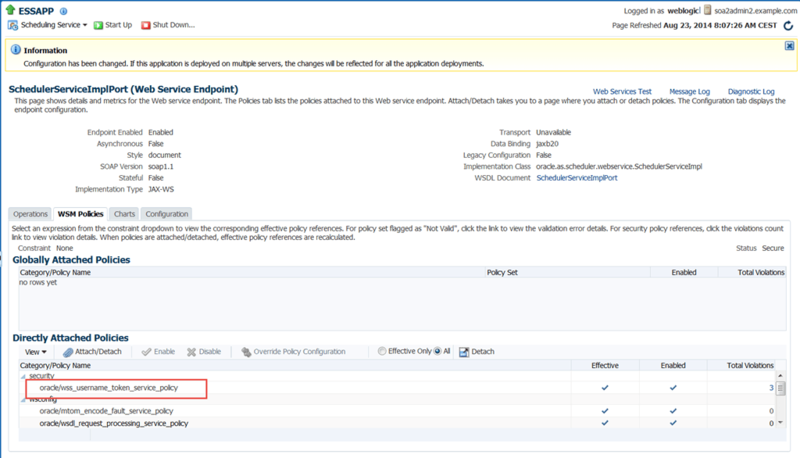 To ensure we do not run into this problem, we have to attach a WSM security policy to the ESS Web Service and pass a WS Security Header with valid username and password in our request. 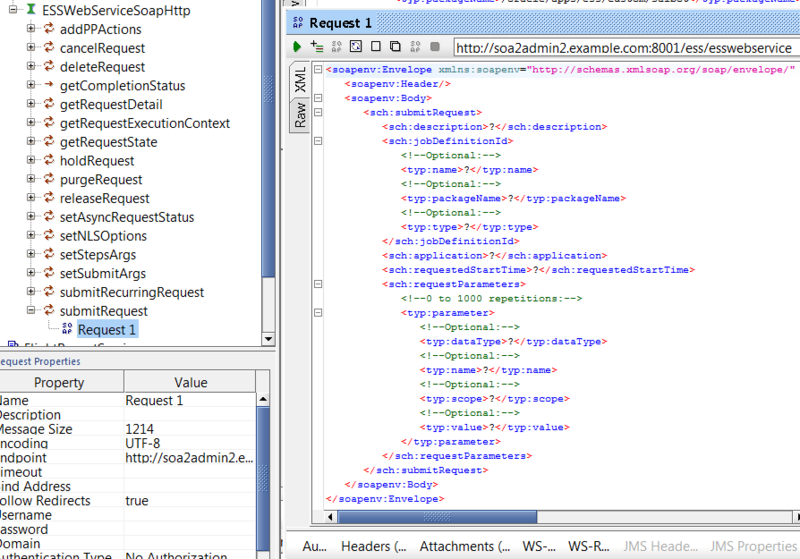 Then the job request is made in the context of a validated user and this problem goes away. 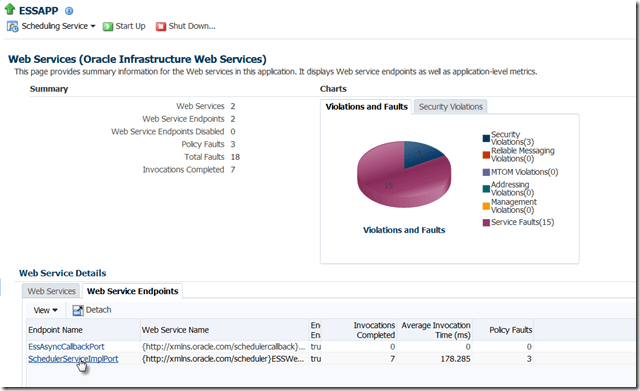 You will be taken to the Web Service overview page. Click on the link for the SchedulerServiceImplPort. Click on the icon labeled Attach/Detach. Now you find yourself on the page where policies can be attached to this Web Service (port binding). 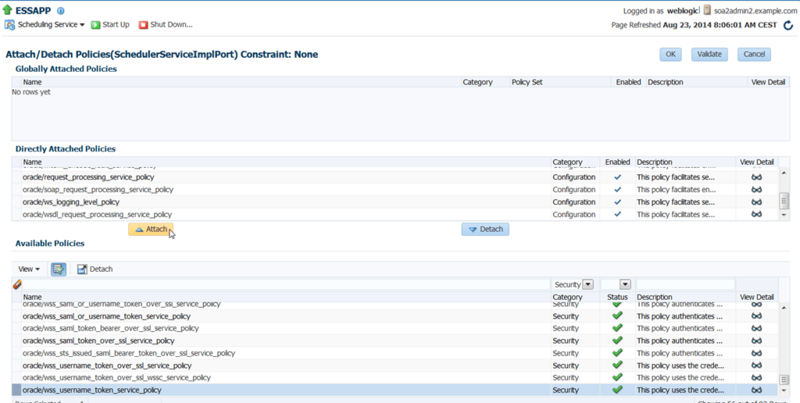 Find the security policy oracle/wss_username_token_service_policy in the list of available policies. 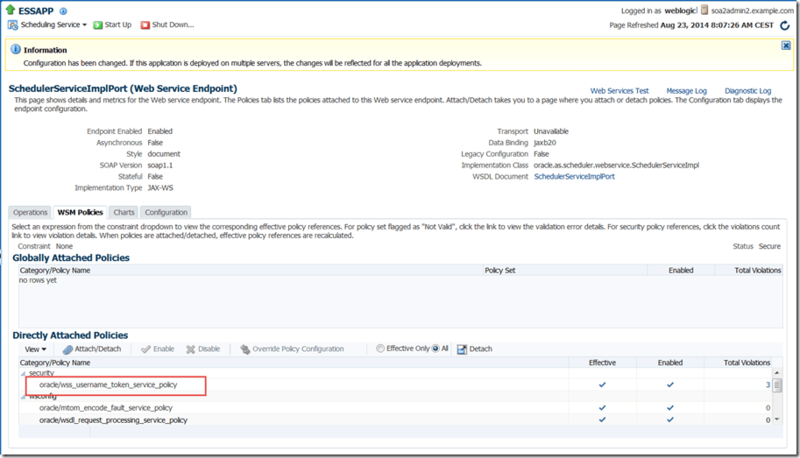 Click on the Attach button to attach this policy to the ESS Web Service. Click on OK to confirm this new policy attachment. 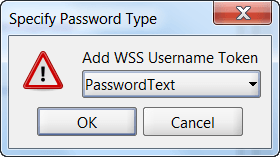 At this point, the ESS Scheduler Service can only be invoked by parties that provide a valid username and password. 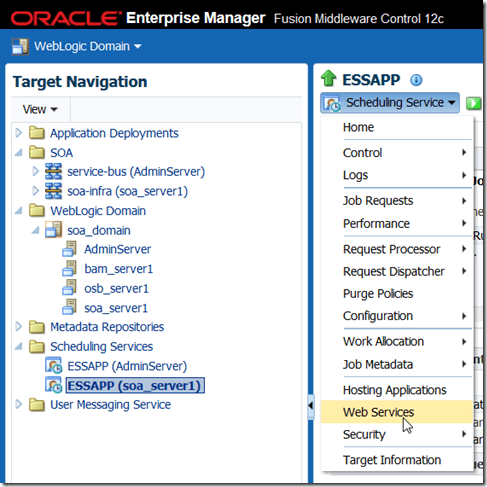 As a result, the Web Service’s operations are executed in the context of a real user – just like job related operations performed through the EM FMW Control’s UI for ESS are or actions from a client application through the Java API. The WSDL opens. 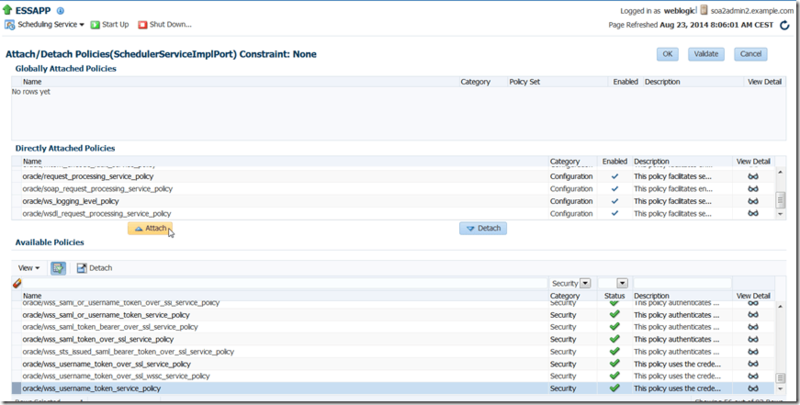 We can see from the WSDL that the WS Security policy has been added. 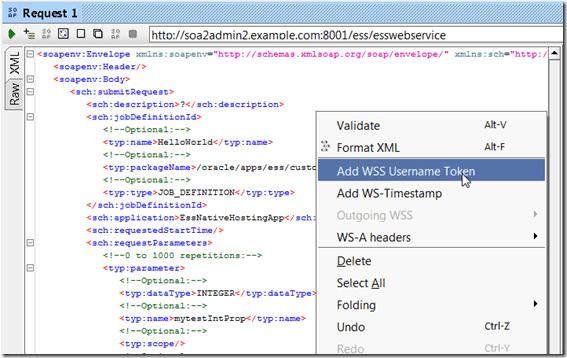 We will need the URL for this WSDL document to create the SoapUI project. The request to the submitRequest operation is the request that will cause a new Job Request to be created (and therefore a job to be executed, one or potentially many times). 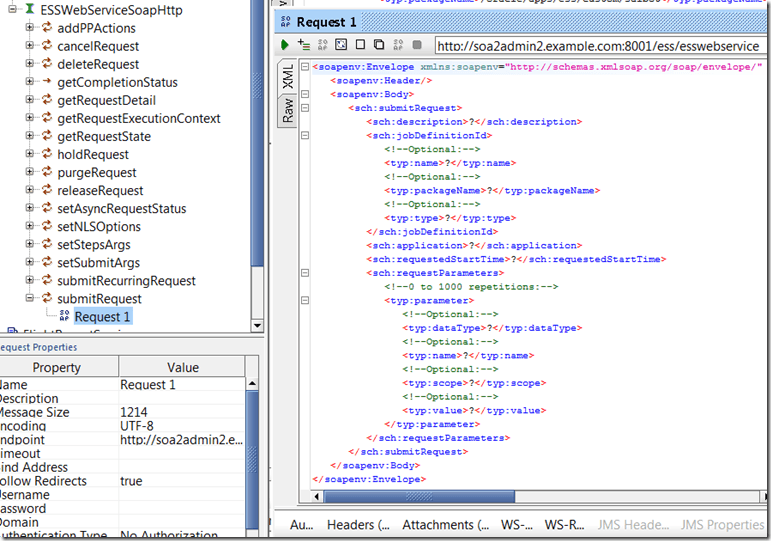 Open the request that was generated by SoapUI. All details have been provided in the request message itself. 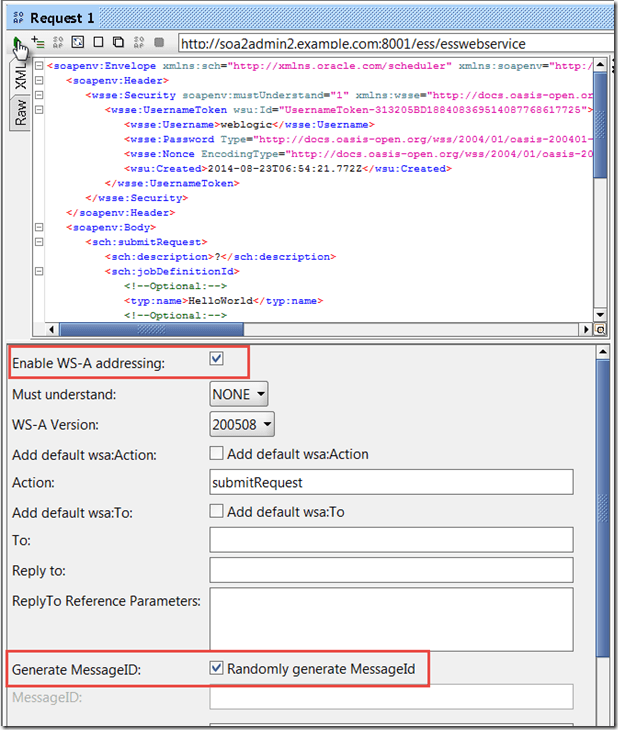 However, trying to submit this request will fail for two reasons: no security details (a WS Security header) are passed and no WS Addressing details are provided – and the ESS Web Service requires those as well. Let’s add the security side of things. 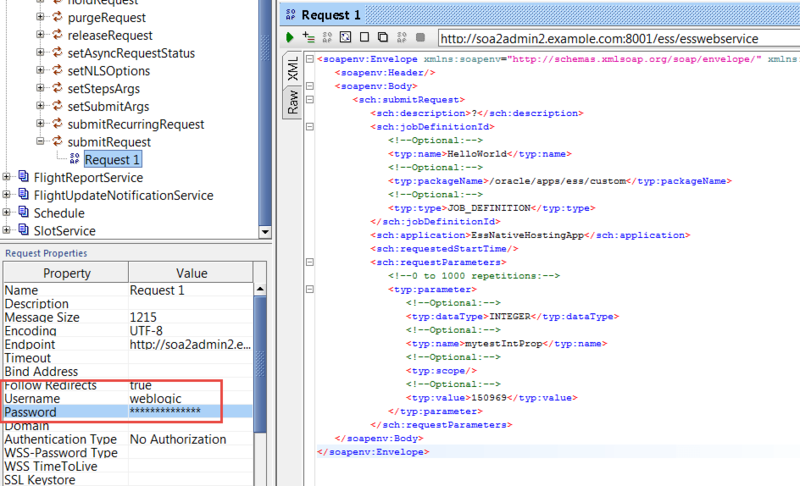 Note the application property value that was passed in from SoapUI to override the default value specified in the Job definition. 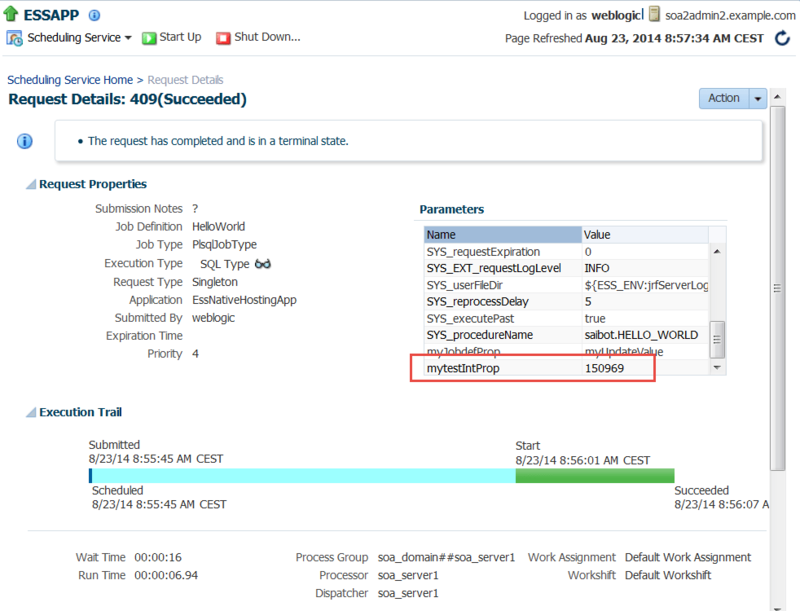 Whatever the PL/SQL procedure is supposed to do, has been done by now. 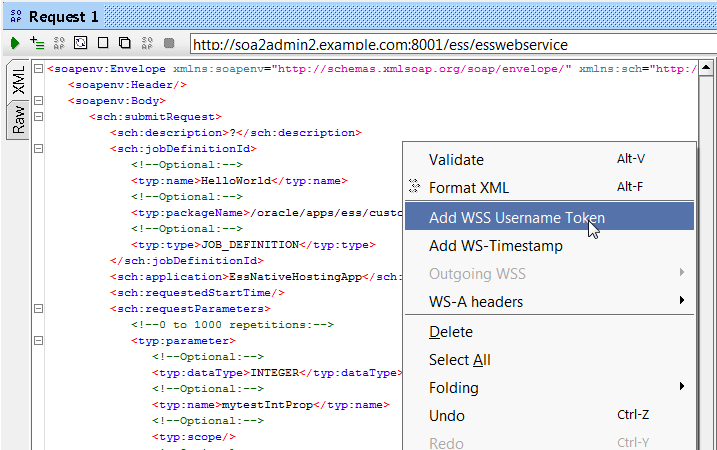 Documentation on ESS Web Service: http://docs.oracle.com/middleware/1213/ess/ESSDG/webservice.htm. ESS job definition can have parameters and user properties. 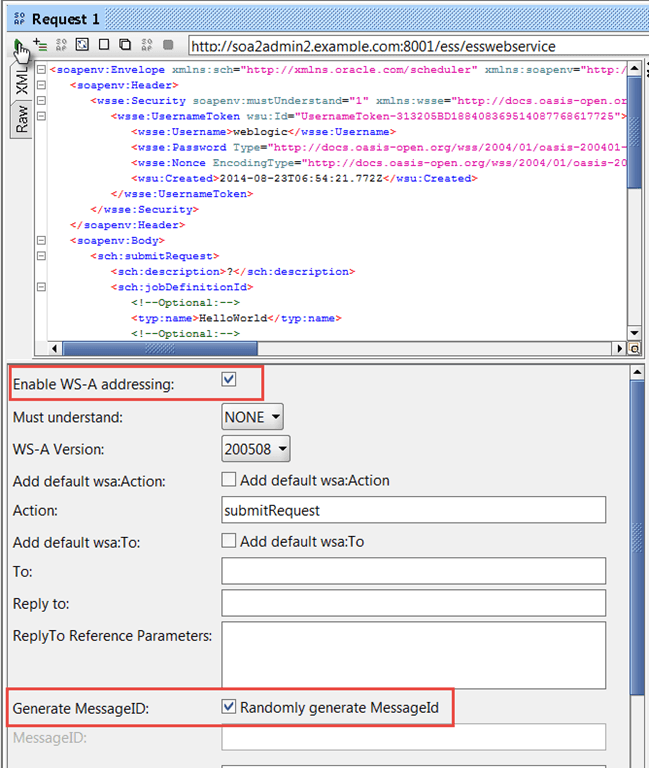 Your example shows how to submit using parameters. 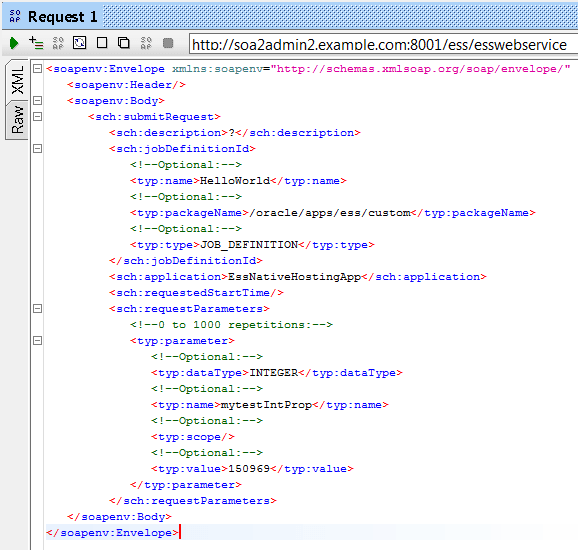 Is there any way to send “user properties” in the web service. Hello Lucas very use full information. I have a requirement like based on time stamp want to retrieve ESS job details. How can I do that. Can you help me with any article on this. I tried this in our DEV environment which is not clustered. It is working perfect. 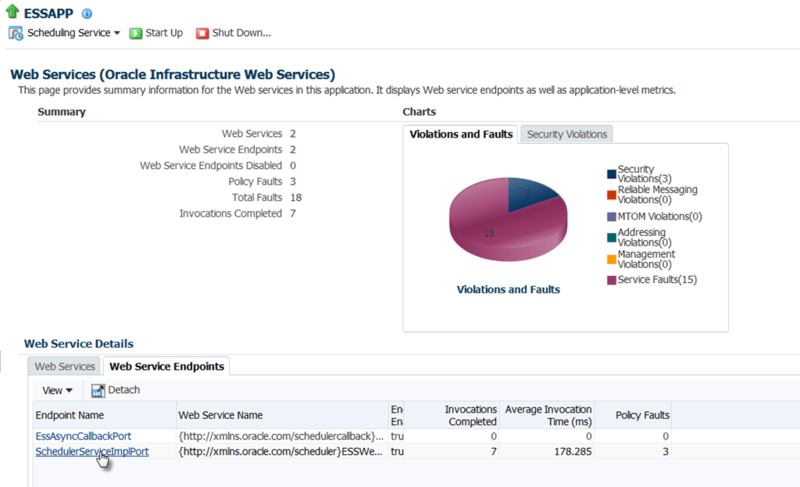 But in clustered environment, Status of WSM policies for this service is “Not Valid”. Could you please give some pointers to resolve this?